So The Live-Action Detective Pikachu Movie Looks... Interesting? Late last year we reported that work had begun on a live-action movie for Detective Pikachu, which is due to come to the silver screen on 10th May, 2019. Brought to us by Rob Letterman, the director behind 2010's Gulliver's Travels starring Jack Black... who knows how this is going to turn out. However, with talented actors such as Ryan Reynolds and Kathryn Newton attached to the project, this could potentially be pretty good. A Japanese website called Front Row has revealed some photos which appear to be from a shoot for one of the scenes in London. 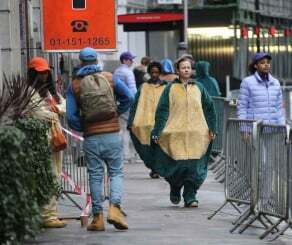 There are extras dressed in Pikachu and Snorlax outfits as well as green-screen suits... so we're not entirely sure where they are going with this. In the photos, we get a first look at actress Kathryn Newton in a rather fetching red blazer. She's playing Lucy, a sassy journalist from the CNM network. 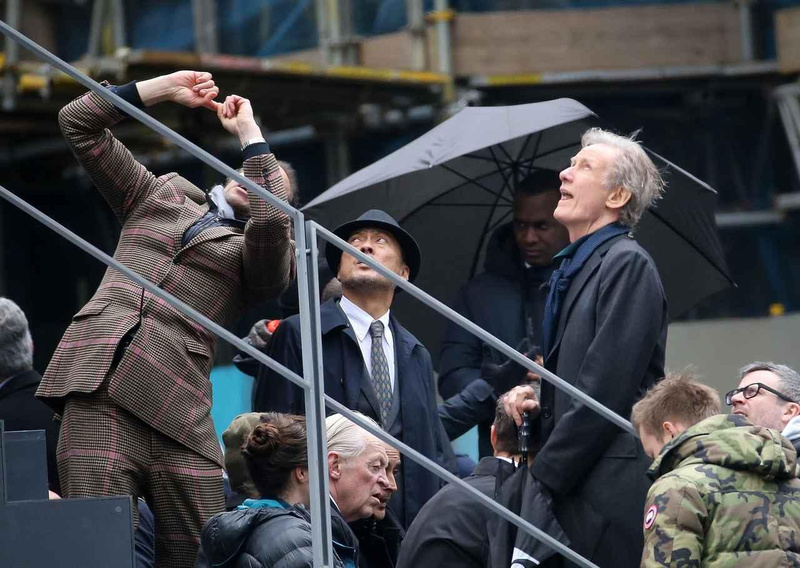 We also see Ken Watanabe in his Detective Yoshida outfit, while Love Actually's Bill Nighy looks on in wonder/bewilderment... we have no idea who he's playing in the movie yet. I’m not sure how I feel about this movie, but im a hopeless Pokémon fanboy so I’m going to watch it anyway. So bizarre. Interested in where things are going. @AlexOlney Y'mean that one science guy? Second Super Mario Bros. Movie ? Count me in !!! Probably going to get replaced by cgi elements. 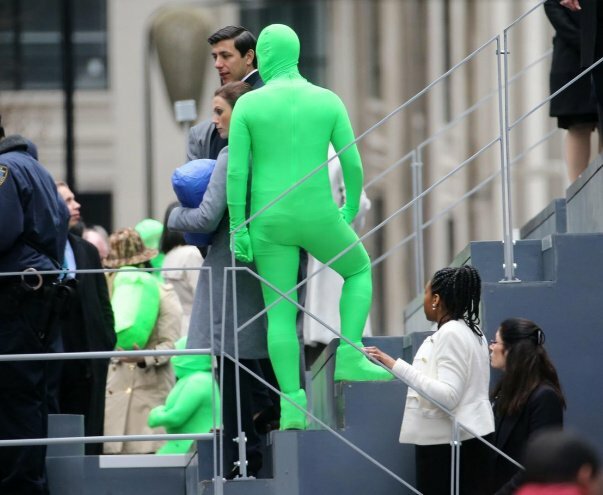 People dressed as Pokemon or in green suits might just be for reference as to where things go. I dont know what i expected, but definitly not something like this. 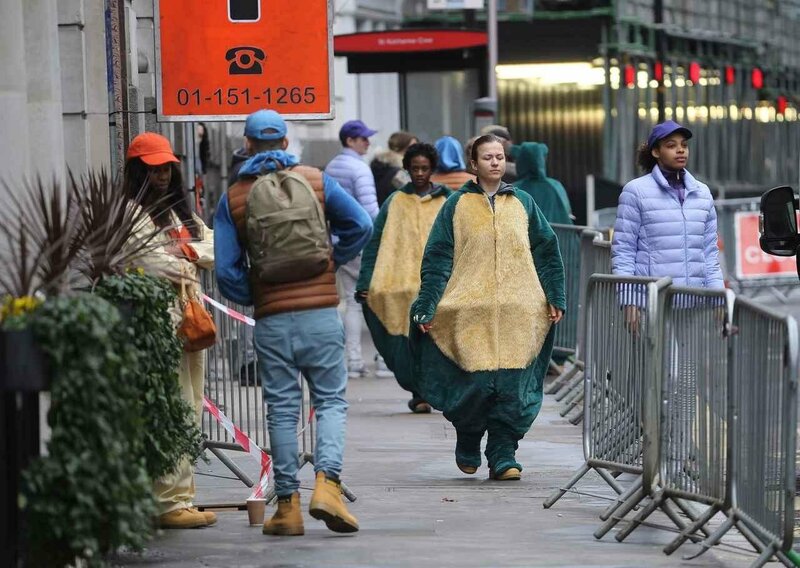 Those Snorlax suits look stupid. Wait . . . am I missing something? Surely the Pikachu should look just like the one in the game, no? 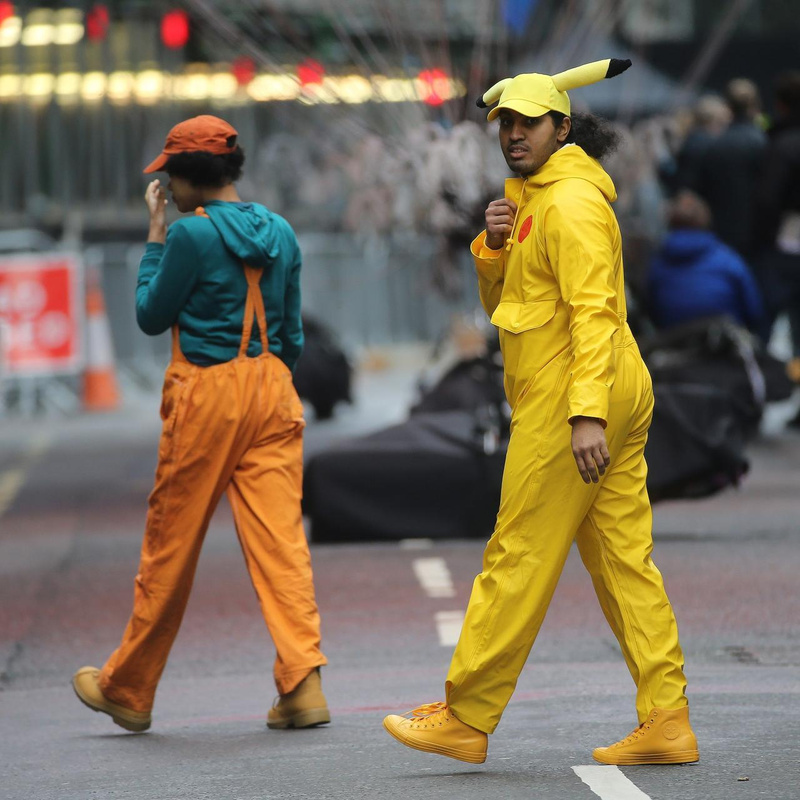 I'd guess the one in dungarees is a Bird Keeper (wears a similar outfit in FRLG), and the Pikachu outfit I'd guess is a Poke Fan (often wears Pikachu merchandise, although that specific outfit is closer to that of a Poke Kid, that guy is too old). I also noticed that it looks like some of the extras are holding green screen 'bundles' to stand in for Pokemon they'd be carrying so that they've actually got some weight to hold. That guy in the Pikachu suit is the greatest thing I have ever seen. @MH4 You're thinking Bill Nye who is different than Bill Nighy, if you've ever seen Shaun of the Dead he's the step-dad that gets turned into a zombie. Meh, good or bad, I'll probably still end up watching it. It can't be a worse adaptation than The Last Airbender. 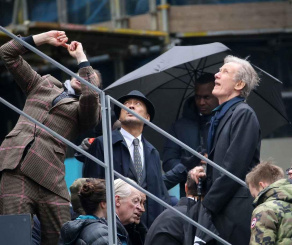 Bill Nighy the Science Guyhy! Anyway, I know it won't happen, but I'd probably go see this day one if Pikachu looked like a guy dressed in a Pikachu bodysuit in the final product. Better yet, go all out and put Danny DeVito in a Pikachu bodysuit. Pay through the nose for it if you have to. I see a lot of comments confused, and possibly the article author is confused as well? 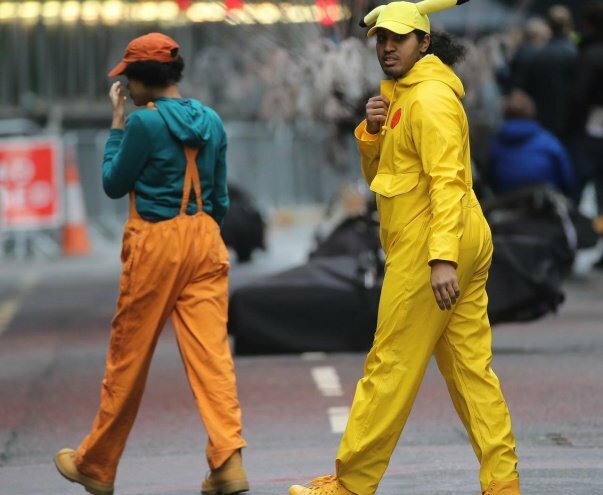 The people in suits, such as the Pikachu, are stand ins that will be replaced by computer generated Pokemon. This is done so the human actors have something physical to relate to. So for example they know what direction to look and to speak to. @dougphisig That was the joke. ken Watanabe is an outstanding actor! Parts of the story take place at an amusement park and a carnival parade. The people in the Pokemon costumes may be performers at the park/parade. It actually looks to me like the scene could be some kind of parade. Those big balloons, like they use in Macy's Thanksgiving Day Parade in the U.S., usually have people in comfortable yet themed clothes underneath them. I don't know that they would have CGI stand ins in such elaborately frumpy clothing. My money is on the streets being barricaded for some sort of parade. 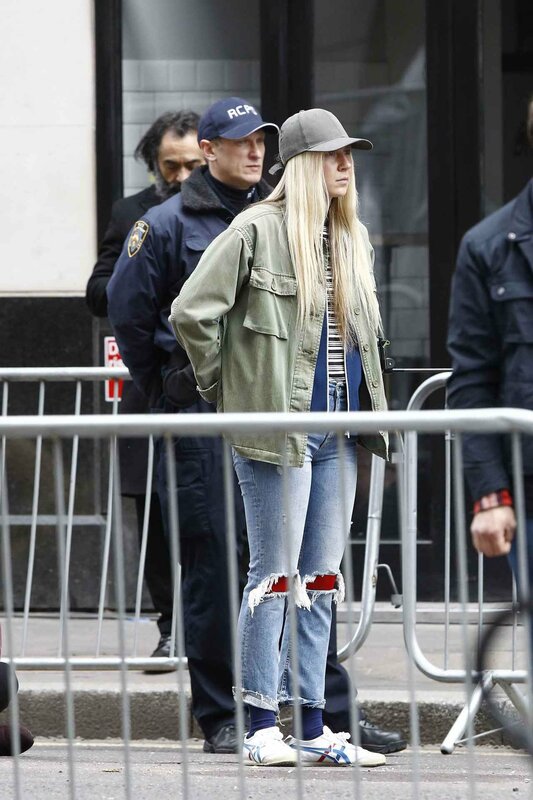 Damn, now we know the albino hipster did it. I cannot stand live action adaptations of content that began as an animated work. There is not one that I have liked. But this is weird in that it is kinda half adaptation half original - made as part of this Detective Pikachu spin off series they are pushing really hard. I don't know what to think about it. @ZurapiiYohane OMG your profile picture! I haven't seen that show in years, but I remember a lot of creepy fan art back in the Deviantart era. @ZurapiiYohane Well I last I check DA is still there. So I imagine the pictures are too. Don't say I didn't warn ya. This is going to be a train wreck. Bill Murray and Garfield are springing to mind. "Brought to us by Rob Letterman, the director behind 2010's Gulliver's Travels starring Jack Black... who knows how this is going to turn out." He also directed Sony's terrific meta-adaptation of Goosebumps in 2015, as well as the highly underrated Dreamworks classic Monster vs. Aliens. One bad film doesn't make a director, Mr. Calvert. Based on your logic, we should judge Spielberg by 1941 and Pixar by Cars 2. 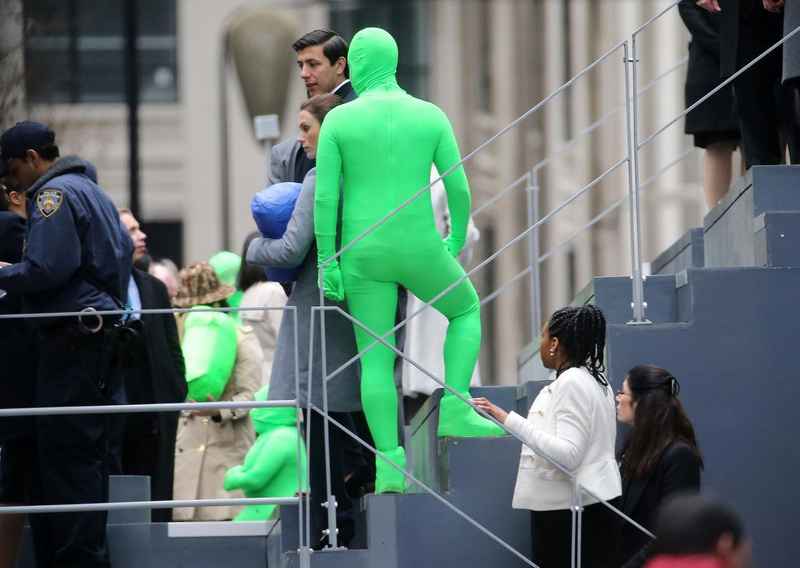 Also, to everybody concerned about the images: They're stand ins. They're used to show the actors where they're supposed to be looking, and WILL be replaced in the final film with the Pokemon we know and love. Really, you should all be thankful for these images - at least in this one, it'll actually look like the Pokemon are there. @HappyMaskedGuy I understand your concerns, but think they're unfounded. Christ, we've got people from Goosebumps, Gravity Falls, and Guardians of the Galaxy making this. Really, at this point, my only concerns are A) Ryan Renyolds' voice and B) the fact that it's opening a mere week after IW Pt. 2.